So my friend Amber was so kind to send me a gift, a cookbook entitled Nourishing Traditions by Sally Fallon. Since I'm working this week I haven't had enough time to read and digest much of it. Ms. Fallon presents a lot of interesting ideas, some are new to me(canola oil is a man-made danger), some are now commonly held by the nutrition field (eat much less sugar and refined flour), and some I know something about but feel like I could research some more. By the way I have never heard that canola oil is dangerous before and there definitely needs to be research done on this. One of these ideas that I knew a little about has to do with the phytates in whole grains. In nutrition school we were taught that whole grains contain phytates and in your GI these phytates can bind up minerals like iron and calcium and prevent you from digesting them. What I didn't know is you can do things to inactivate some or most of the phytates! And because I am sceptical of one person coming up with new information I did some research. Here's a few abstracts I found on the subject: here and here. The most effective technique is to soak the grains or flour in an acidic medium at room temp before cooking. Hmm sounds like a bread starter to me. Most of my breads are actually prepared with a starter, because this improves the flavor and makes them easier to knead. And now it sounds like starters are good for another reason too! I am going to start soaking my add in grains, like the oats and spelt berries overnight before I cook them, with a little lemon juice or buttermilk in the water. If I can just remember to do this I'll be doing good. If you want to try this at home it would be easy & your grains would cook quicker. I'm thinking of oatmeal in specific, and this technique is fine for whole, rolled, cracked, or completely milled (flour) grains. Another benefit of this is your grains will cook quicker in the morning! I'm glad you like the book. And thanks for the bread! I had to fight my husband away from it -- we opened the box right before dinner and it looked so yummy! 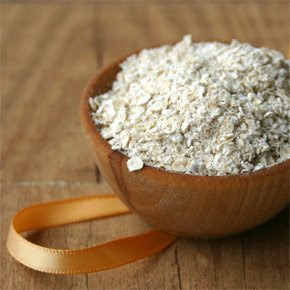 I have tried soaking rolled oats and boy am I a fan. For 1 cup of any grain add one cup of warm water plus 2 tablespoons whey, yogurt, buttermilk, or lemon juice (for those with dairy allergies). Let soak for 7- 24 hours. Saves time & electricity too!